The provincial gold medal-winning Aldergrove Ambush showed their ability to play under pressure earlier this month. The U17 girls soccer team took top spot at the B.C. 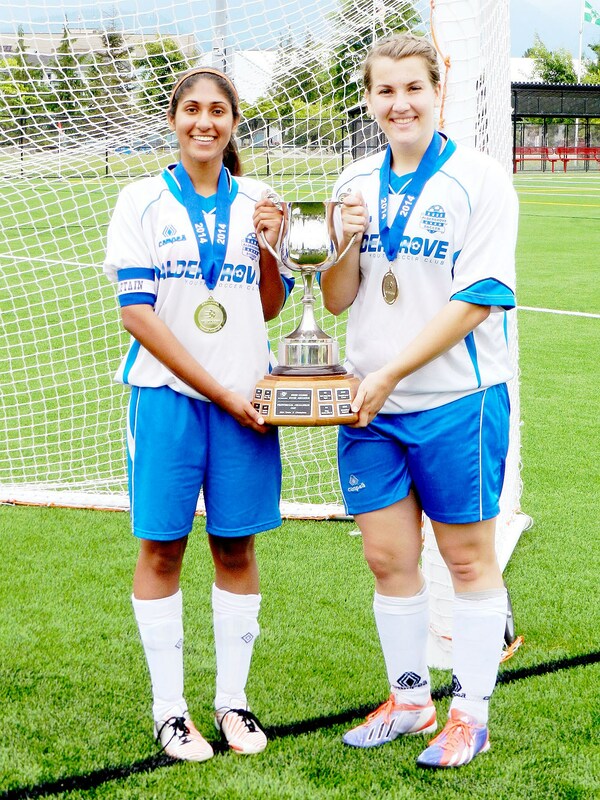 Provincial B Cup Championships which took place in Chilliwack July 3-6. There were 48 teams representing their zones from all over the province in six age groups, ranging from U13 to U18. All of Aldergroveâ€™s games were very exciting, showing great displays of skill, energy, athleticism, and enthusiasm. Early in the tournament, the Ambush tied the Coastal FC Royals 1-1, edged the Nelson Selects 2-1, and blanked Vernon United 1-0. These outcomes advanced the Ambush to the final against the Prospect Lake Lakers. The game was evenly matched, with the teams deadlocked at 3-3 at the end of regulation time. Overtime play was very intense but did not decide a winner. The Ambushâ€™s dreams of victory finally became a reality as the last shootout goal flew past the Prospect Lake goalkeeper. The teamsâ€™ success was due to the teamwork and effort of Navdeep Rai, Charndeep Chattu, Tarndeep Chattu, Janelle Stephens, Laura McNeil, Kristiana Kamagianis, Taylor Andresen, Shireen Kaur, Kelsey Olsen, Amaneet Ark, Jade Hik, Valerie Mensah-Wilson, Hanna Morris, Vanessa Mensah-Wilson, Julie McNeil, and Hanna Gill, as well as Kailey Snow and Ravien Sidhu, who joined the Ambush for the championship. The Ambush had their own cheering section in Chilliwack, including parents, family and friends, members of Aldergrove Youth Soccer Club, and noisy fans who rang cowbells and sounded their horns during the tournament. The coaching staff of Dave Stephens, Bob Singh, Kulwant Rai, Brian Hunter, and Bill Ede guided the team this season.